I wear so much pink everyday that on Valentine's Day I like I like to mix it up and wear red. However I look in a little crazy in all red so usually I just choose to wear red accents, which happens to be what I did today. 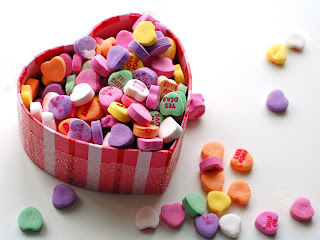 Here are the little touches I added to my outfit today to help celebrate Valentine's Day! On my fingers I did a special Valentine's mani! 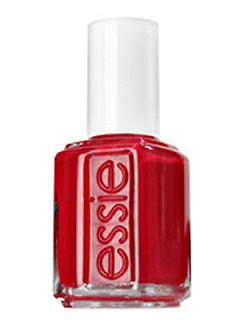 I am wearing Essie's Long Stem Roses, which is a pretty red color with a little bit of a sparkle. I then used my konad to stamp little silver kiss marks on them... pretty darn cute. I also decided to do a red lip today. For this I used Wet m Wild Diamond Brilliance in the color Tamara's Tiara. It is a really pretty dark red with a lot of sparkle to it. I like this product a lot. It goes on nicely and stays put for a long time. 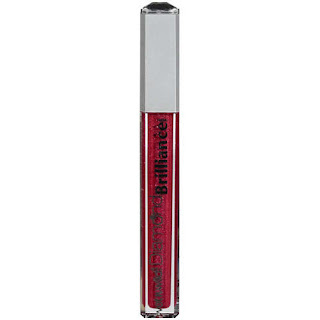 Plus it is gloss so you don't get the caking of the bleeding of a lipstick. Plus it was super affordable. I also set everything off with some red earrings. Another thing I wore today that wasnt exactly red was my perfume. In honor of Valentines I spritzed on some Pink Sugar. This perfume smells exactly like cotton candy, which for some people would be bad but I LOVE IT!! I thought the sweet sugary smell was perfect for Valentine's!